A few weeks ago we had a birthday party for a member in my family. As the hostess of the party I needed an easy-to-prepare birthday cake recipe that every person would enjoy. 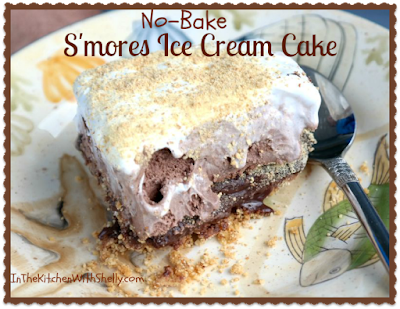 I headed on over to the Country Crock web site and found their S'mores Ice Cream Cake Recipe and decided to make that. Let me tell you...it was a huge hit! Since making it that first time...I've now made it three additional times and it never lasts long! You can print the recipe directly from the Country Crock website or grab it below. Delicious!!! Combine graham cracker crumbs, melted Country Crock® Spread and sugar in medium bowl; press into 13 x 9-inch glass or ceramic baking dish. Microwave chocolate chips, 2 cups marshmallows and milk in small microwave-safe bowl at HIGH 4 minutes or until completely melted, stirring once. Cool 10 minutes, then stir in remaining 2 cups marshmallows. Spread over crust; freeze 1 hour or until firm. Sprinkle crumbled graham crackers over chocolate layer. With scissors, cut carton from Breyers® Chocolate Ice Cream. Arrange Ice Cream on its side, then cut crosswise into 4 slices. Arrange slices in baking dish, pressing to form an even layer. Cover and freeze 4 hours or overnight. Disclosure: Recipe is courtesy of Country Crock. The photograph is copyright & courtesy of Shelly Hill ~ Owner of the Shakin 'N Bakin Foodie Blog. Anyone who loves S'mores will love this recipe. It is not hard to make and should taste delicious. Since I love dark chocolate I probably would add some chopped dark chocolate on top.